Click here to view this year’s gallery of winners (with links to images). This poster by fifth-grader Alaina Stecher of Christ the Teacher School in Newark is the winner of the Delaware Forest Service’s annual Arbor Day Poster Contest. The Delaware Forest Service sponsors an annual Arbor Day Poster Contest for Delaware school children in grades K-5. Poster contest information packets are mailed every January, with awards presented in April during our annual Arbor Day Ceremony. The Delaware Forest Service also distributes free pine seedlings annually to Delaware elementary school children on a first-come, first-served basis. 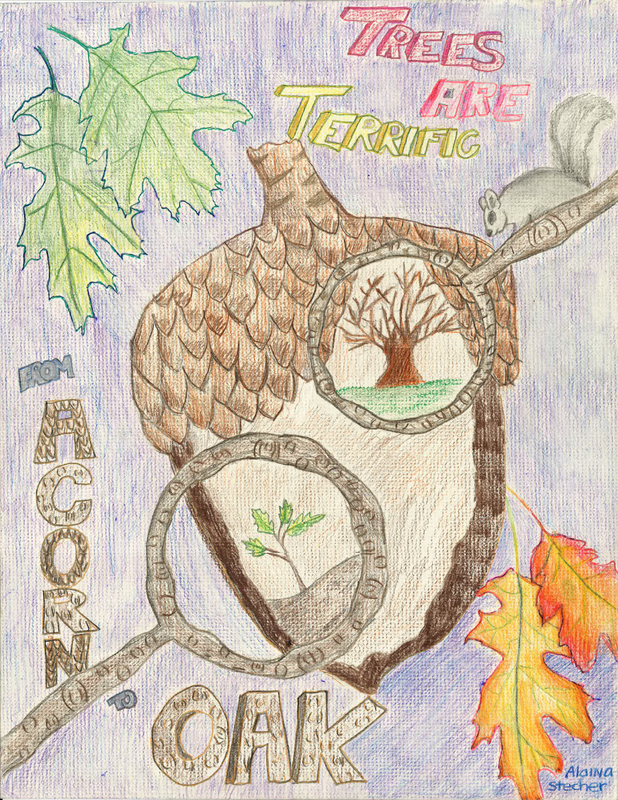 The annual Arbor Day Poster Contest is designed to teach students about forests and forest resources. 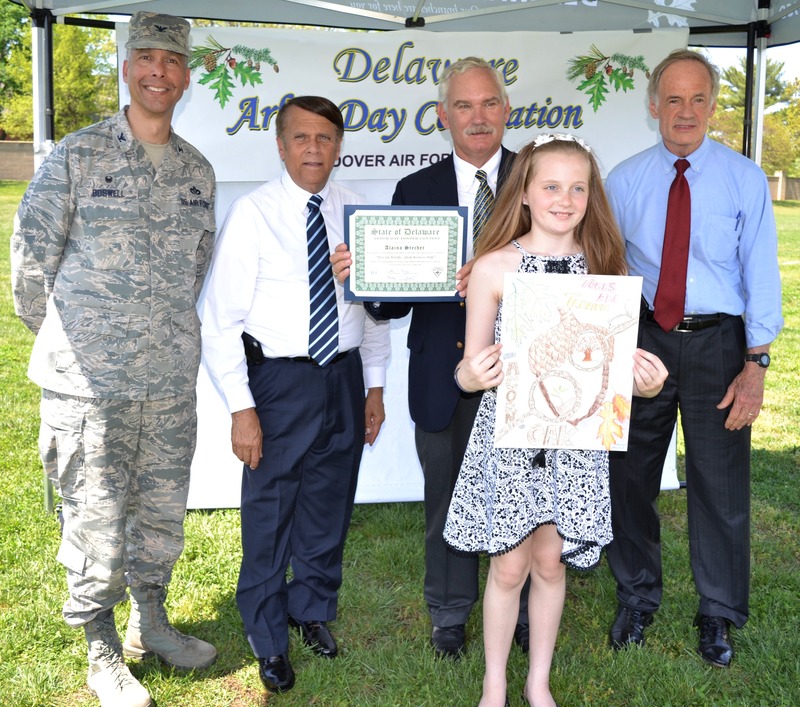 Participating in the poster contest is a way to learn more about the role of trees in our state and their direct impact on the health and wellbeing of Delaware residents. This year’s theme, “Trees Are Terrific…from Acorn to Oak!” is designed to increase knowledge about the importance and diversity of the oak tree as well as introduce students to the process of tree identification. Oaks have offered us shelter, beauty, and resources, as well as serving as a symbol of strength throughout the history of the United States. Through basic classification skills students will recognize unique characteristics that separate oaks from other trees. The annual school poster contest is open to all K-5 public, private, and charter schools as well as other organized youth groups and after-school programs. A total of 126 classrooms from 40 schools participated in this year’s contest, with 3,647 students creating original posters. Winners were selected from each county in the following grade categories: K, 1 & 2, 3 & 4, and 5. Judging criteria were: originality, use of theme, neatness, and artistic expression. Each winner receives a tree-themed book and a print reproduction of their poster on fine art canvas. Thanks to corporate sponsor Delmarva Power, a free tree planting ceremony will also be held at each winner’s school. In addition, every participating classroom receives free pine seedlings for all participants. This year, students from the Middletown High School FFA Chapter and senior volunteers from the Modern Maturity Center in Dover wrapped thousands of seedlings for schoolchildren statewide.